You get all the benefits of MasterSell’s proven sales methods and you know exactly what your agency fee will be. It’s simple. We inspect your property and discuss your price range. Our fee is based on your lowest acceptable selling price (it’s like setting a reserve price). The fee is then calculated and fixed – and it includes basic advertising and GST. Your fee is paid up front, and it won’t go up – ever. Once we agree on a selling price, we then discuss what the asking price or price range is. If we sell for more than you hoped, even if it’s thousands of dollars more, you don’t pay another cent. And you benefit from our very high standards of professional service until your property is sold. We place all advertisements, answer all enquiries, qualify potential buyers, book appointments, follow up potential buyers, negotiate the sale and prepare solicitor’s paperwork. You ensure the property is presentable at the time of inspections. You also show potential buyers through your property and you may also need to erect your signage. 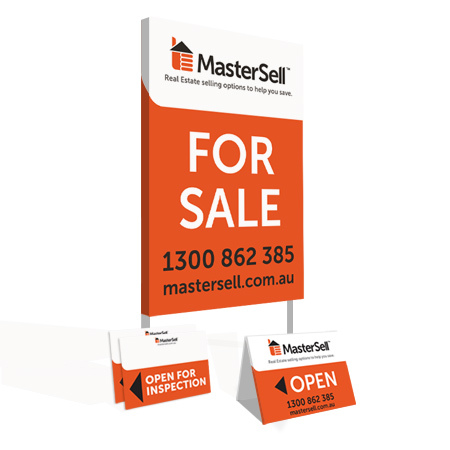 By providing you with our sales and marketing service, you agree to pay MasterSell Australia a pre-determined up‐front fee (that includes your basic advertising program). If you purchase additional advertising or any other service that does not form part of the Agent Managed Sale package, you agree to pay for such advertising or services when placing your order. PAYMENT: You agree to pay MasterSell Australia $235 upon completion of the on‐line “Request an Agent Form” to inspect your property. This fee forms part of the pre‐determined up‐front total fee payable to MasterSell Australia. The pre‐determined selling fee can be calculated using the MasterSell Selling Fee calculator. MasterSell Australia agrees to refund $235 should you proceed with the Agent Managed Sale within 3 months of the MasterSell agent inspecting the seller’s property. You agree and confirm that $235 will not be refunded should you not proceed with the Agent Managed Sale after 3 months of the MasterSell agent inspecting the seller’s property or should you not proceed with the sale whatsoever. Upon receipt of the completed on‐line “Request an Agent Form” form, the MasterSell agent will contact you to book an appropriate time and date to inspect your property, offer presentation tips and marketing advice, take photos if necessary and prepare a property appraisal that includes comparable sales and assist you with setting the sale price. If you choose to pay using the cheque method, bank clearance must be confirmed by MasterSell Australia before the MasterSell agent inspects the your property. Please see full Terms and Conditions for further details on payment. Please complete the below "Request an Agent" form. Once you have registered, a MasterSell agent will contact you to organise a time and date to inspect your property, offer presentation tips and marketing advice, take photos if required and prepare a detailed property appraisal. A registration fee of $235 is required to book your MasterSell agent. This fee will be refunded in full once you proceed with this package. We design and print flyers with OUR contact details, and post to you to hand out at inspections. The buyer can contact us direct if they require more details about the property. 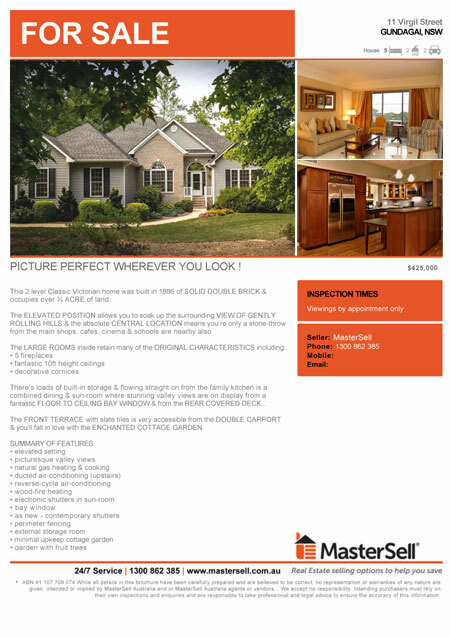 We can also email the flyer if buyers provide you with their email address. We’re with you all the way, and we stay with you until your property is sold. That’s it! And remember – we stay with you until your property is sold!